can see,they are like boxes that beekeepers stack up! Just like you have a home that you live in, honeybees also have a home they live in too! 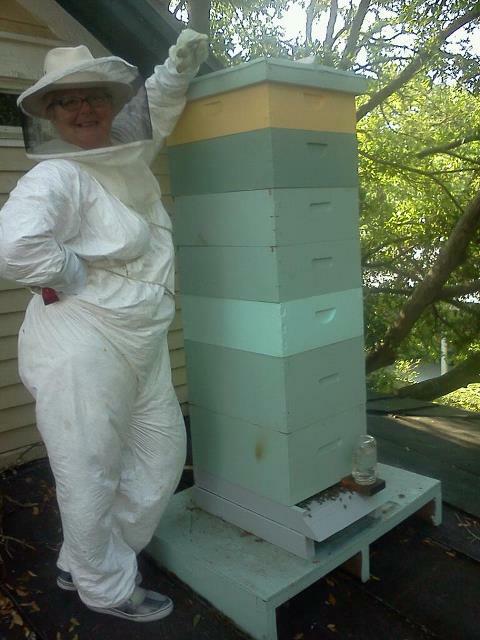 Beekeepers call this home the hive; you may have seen a beehive in a field or orchard while on a trip with your family! Today, we are going to talk about the different parts of the hive. can see there are 10 wooden frames that we can take out! 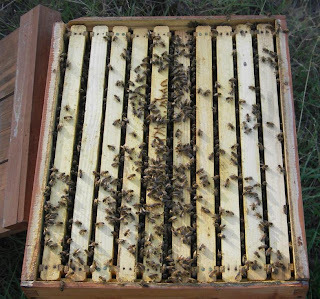 Each hive is made up of boxes, which have wood on four sides and are open on the top and bottom. Beekeepers stack up these boxes and paint them. 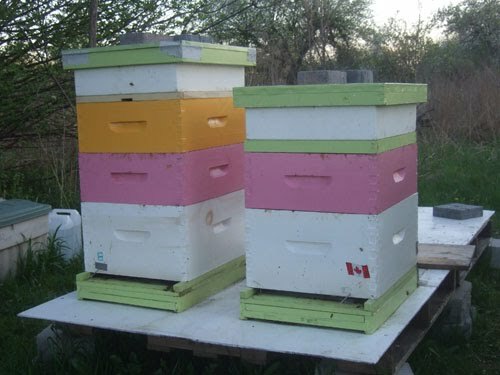 Often they are painted white, but some hives are brightly colored! In each box, there are 8-10 rectangular frames that fit perfectly inside. so that honeybees could start building beeswax. The outside of each frame is made out of wood, and on the inside, beekeepers give the honeybees a thin sheet of beeswax, which we call foundation. 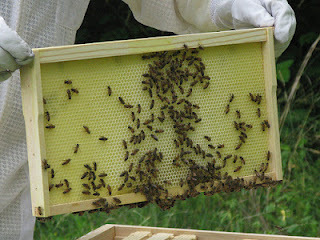 From that beeswax sheet, the honeybees build six-sided beeswax cells. The hexagon is the perfect shape for the bees to make in order to not waste space or beeswax! Inside the beeswax cells the honeybees will store everything they need to survive: the queen will lay eggs in some cells, and in other cells the bees will store honey and pollen. In the spring, beekeepers usually start out with one box because after winter there aren’t a lot of workers to fill the box up with honey, but as summer goes on the honeybees will run out of space in that one box, so beekeepers put another hive box (with frames) on top of it. In the boxes on the bottom of the stack, the queen lays eggs. Beekeepers call this section the “brood chamber” because that’s where the eggs, larva, and pupa (called “brood”) of the honeybees develop before they hatch out of their cells. The Queen Excluder keeps the Queen in the bottom boxes! As you can see, it's like a wire rack. 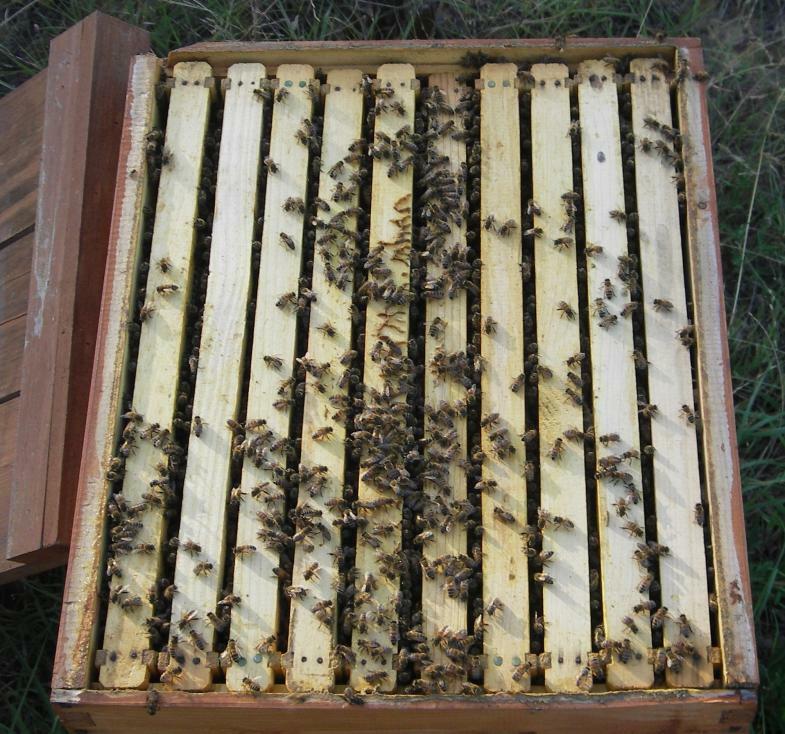 After the queen excluder is put on the hive, beekeepers keep adding more boxes on top of it as the honeybees make more honey. Beekeepers call these boxes “supers” because that’s where the honey is stored. By the end of summer, the hive could be taller than you! At the very top of the hive there are two covers. 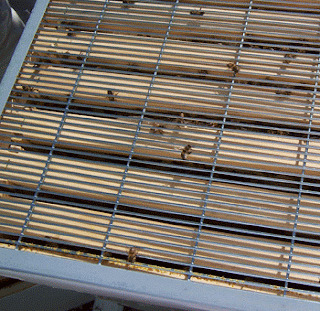 There is an inner cover, which gives the bees a little more room or insulation, and an outer cover or telescoping cover protects the hive from rain and predators. bees made lots of honey! Keep an eye out for a honeybee hive next time you’re traveling somewhere!